Unlike some of the more commonly encountered species of otters, the hairy-nosed otter is an elusive and rarely encountered animal throughout its native range in Southeast Asia. The dead otter was a female 1.2m in length and its location was less than four meters away from the nearest water source, a black water creek running parallel to the road. the dampness of its coat of fur probably suggests that the otter met its end right after it left the creek and onto the road. This record was recently published in the IUCN/SCC Otter Specialist Group Bulletin and you can read more about the article here! I was just about to go home from work on 14 May 2015, when I saw a message on my phone from Marcus to the Toddycats, “Anyone on campus would like to head down with me for a carcass salvage?” Intrigued, I replied that I was free and could help out. 20 minutes later, I was climbing into a van heading towards Changi. 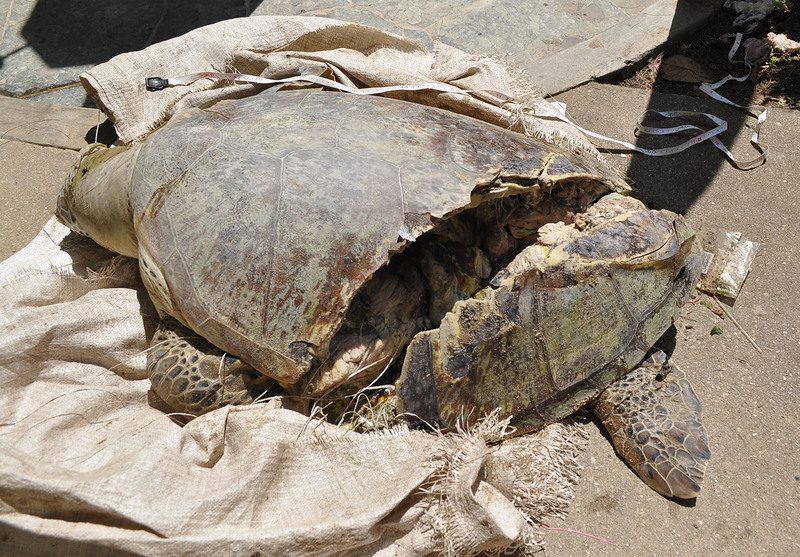 I expected the carcass to be a roadkill, so it was a bit of a shock when Marcus told me that it was actually a Green Sea Turtle (Chelonia mydas). It was thought to have been hit by the propeller of a boat and had been split across its shell. 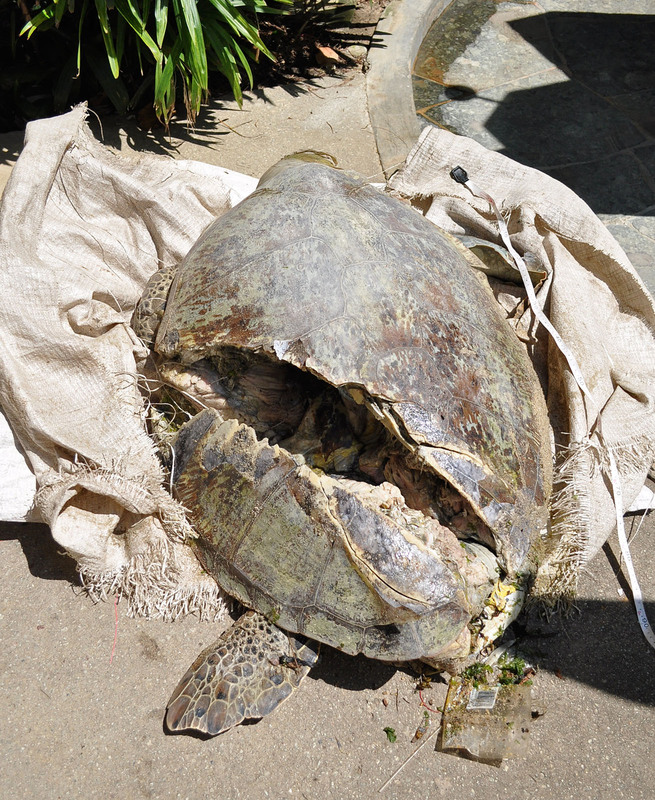 NParks had kindly brought the carcass ashore and had kept it aside for the Museum to collect it. The large sea turtle had been split across the carapace. We drove over to Changi Beach Carpark 6, stopping only to pick up the taxidermists. We met Ruth Tan, NParks manager of coastal parks, who facilitated the salvage process and showed us where the carcass was held. After donning the necessary PPE (vinyl gloves and N95 mask), we carried the carcass over to a designated area, where the taxidermists could work. 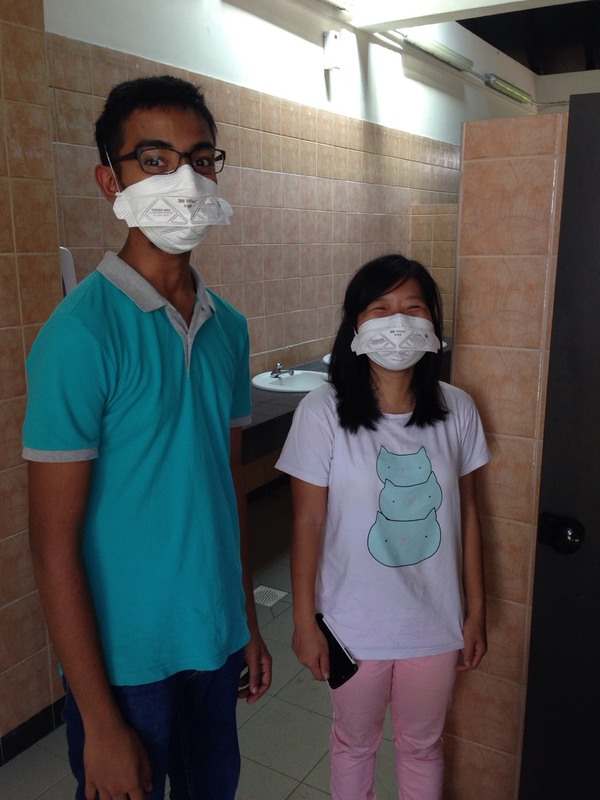 Despite the masks, the smell was pretty bad. The first thing we did was to take measurements and “crime scene” photos for record purposes. The turtle was large, with a carapace length of about 0.8 m. Marcus also ascertained that the turtle was a female, based on the short tail length. We took tissue samples from the carcass for cryogenic preservation. Since I had never taken a tissue sample before, Marcus showed me a couple of examples before allowing me to do one. Is the haze back? Nope, just wearing the appropriate PPE! As the taxidermists expertly prepared the carcass, structures of the turtle’s skeleton became apparent. 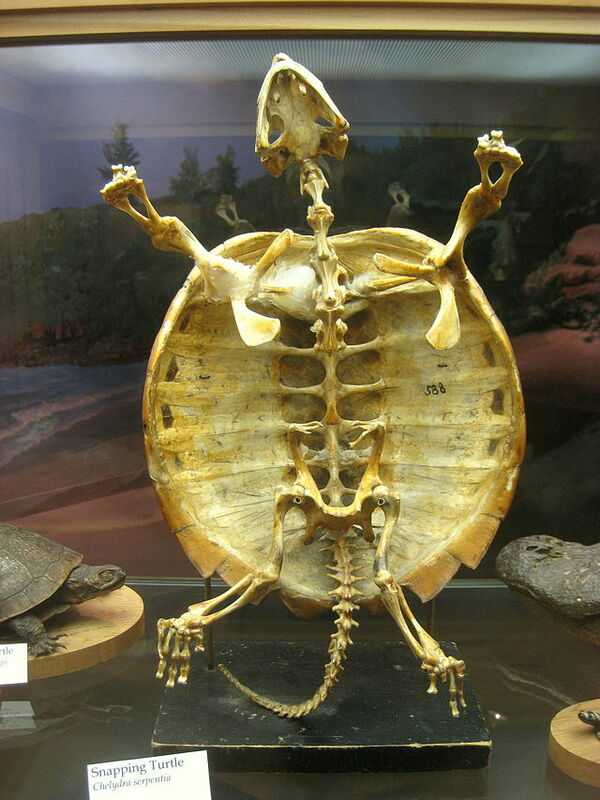 I saw how the carapace (upper section of the shell) of the turtle was essentially formed out of a modified backbone and ribs like the specimen in the image below. This specimen is a Snapping Turtle (Chelydra serpentina) at the Museum of Science in Boston. Image by Daderot. Because the boat’s propeller had split the shell in two, we were given a rare look into the cross-section of a Sea Turtle. It was genuinely a surreal experience. We were all thoroughly impressed by the speed and professionalism that the taxidermists exhibited. Measuring the Sea Turtle’s carcass. As the turtle was being deconstructed before my eyes, it occurred to me that this was the first wild Sea Turtle that I had ever seen. It was a pity that my first encounter with this rare creature had to be under such circumstances. While there is an undeniable scientific and educational value of this specimen, it cannot possibly compare to the ecological value of such a large breeding female swimming in open waters. Despite being internationally endangered, the fact that these turtles can be found in our waters never ceases to amaze me. Yet, they continue to be threatened by human activity, which this specimen serves as a grim reminder of. Nevertheless, it shows that we as humans have an important role to play in the conservation of such marine biodiversity. 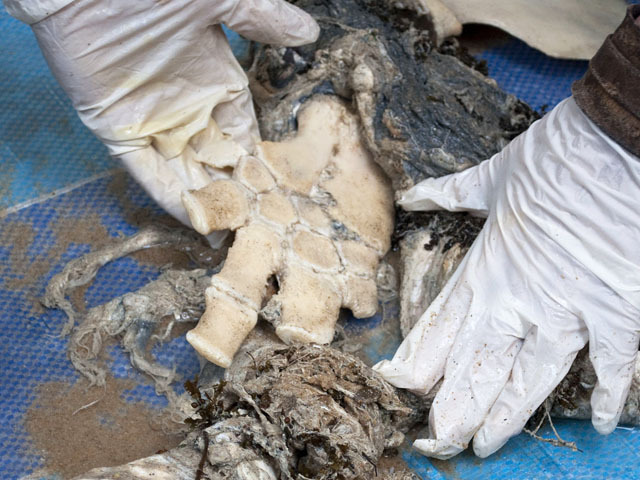 A carcass of an unidentified vertebrate washed up at East Coast Park (ECP) beach on 15 Jul 2014. A park user who noticed the remains notified NParks. NParks staff verified the report and passed the message from the Parks division (Liew Qi) to the National Biodiversity Centre (Cheo Pei Rong), to the LKCNHM collections manager, Kelvin Lim, then to me. By now, it was being referred to as a cetacean carcass (dolphin or porpoise). On the morning of 16 Jul 2014, I went down to ECP to check and retrieve the carcass. There, it was confirmed to be indeed a cetacean as the skull, flippers and tail fluke was visible, but in an advanced state of decomposition. Head of the carcass. Photo by Marcus Chua. The decision was then made to retrieve the carcass. The body, which was almost as heavy as me, was bagged with the aid of two very helpful NParks staff, Tan Wen and Jan Tan (who was on her second week on the job). As the carcass was too big to fit in a car, Department of Biological Sciences (DBS) graduate students, Maxine Mowe, Liew Jia Huan and Ng Ting Hui, helped by facilitating a pick up with the department’s vehicle from fieldwork at Marina Reservoir. Ting Hui kindly drove the carcass to the museum. Skeletal flipper of the Irrawaddy dolphin showing the five digits of the pentadactyl limb – like our hands. Photo by Kho Ziyi. Back at the museum, the sense of excitement (it was a rare salvage after all) was enough to motivate the museum folk to brave the stench for a peek at the carcass while it was prepared for bone preservation by Kate Pocklington and myself. Some bits of tissue was frozen for the cryogenic collection. Kelvin quickly selected skulls from the Zoological Reference Collection as comparative material. The carcass was then identified to be an internationally threatened Irrawaddy dolphin (Orcaella brevirostris) measuring approximately 2.2 m. Tammy Lim and Kho Ziyi documented the process, and we all smelled like dead cetaceans at the end of the day.